This resulted in a total grain bill of about 2.4 kilos, so we wanted plenty of water to mash in. Unfortunately the biggest pot I have is about nine litres so we were only able to mash with 7.8 litres of water without filling the pot too much. As with the previous recipe we mashed for 90 minutes at 65 degrees, which seemed to work well last time. After an hour long boil with hop additions, we were left with an OSG of only 1.034, which was much lower than last time’s 1.042 (which had been watered down by mistake!). I think that due to the pot size we were unable to get adequate water to all the grain; we were still attempting the brew in a bag technique which was probably inappropriate for this sized grain bill. Should we try this again I think we’ll need two things: at least one bigger pot to do the boil in and probably a proper mash tun. This would really make things a whole lot easier and we’ll be able to use much more water for mashing. The other problem we ran into was during the cold break. 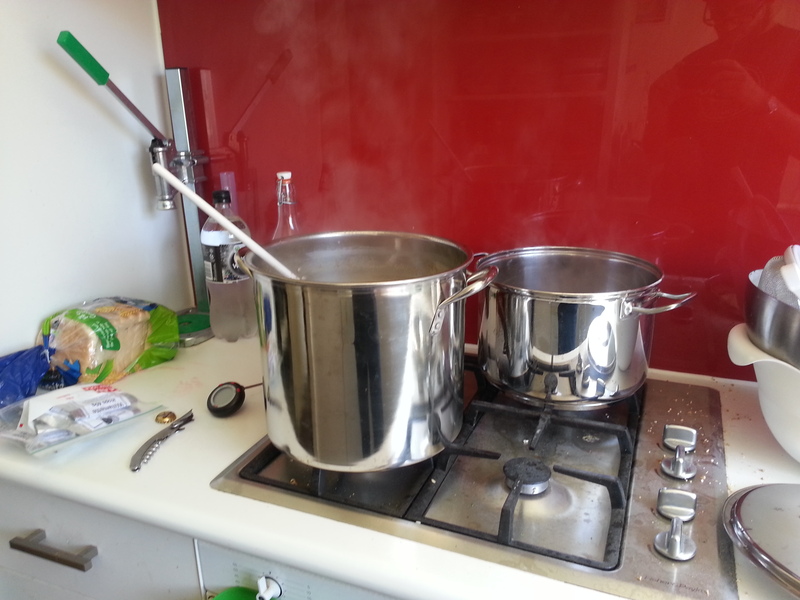 By the end of everything we had about eight litres of boiling water, and we wanted to get it cold fast. Our usual method of giving it a bath in the sink – even with some ice added – failed to get the temperature down in a reasonable amount of time. We’ve had trouble with this before, even with smaller batches. I think I have an excuse to buy a wort chiller now though! All in all it was a great brew day, and as mentioned a great one to get back into it for the year – with no bottling, a long mash, and a bit of time between hop additions, there was plenty of down time! We’ll report back in a couple weeks to see how the beer turned out, but I’m not too optimistic!